This classic book, extensively revised in 1979, includes the most important archaeological discoveries of that time made regarding both the pre-biblical and biblical history of Palestine. The earliest archaeological finds in Palestine reveal man’s presence as early as 9000 B.C., about 6000 years before early biblical history is established. This early phase of human activity was first defined by remarkable discoveries in the Mount Carmel caves and later elucidated by the author’s own excavations at Jericho. This book traces the development of man from hunter and food-gatherer to the earliest agricultural settlements that grew into towns and city states which were eventually incorporated into the Israelite Kingdom. It also discusses the post-Exilic period down to the early fourth century B.C. This book added considerable knowledge about early phases of Palestinian history, particularly due to the inclusion of Carbon-14 determinations and special study of animal and plant remains from Jericho. 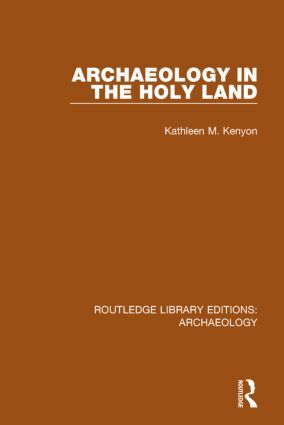 This is a detailed guide to twentieth-century archaeology in the Holy Land that remains fascinating, wonderfully illustrated, and a great aid in understanding life in Palestine as revealed by archaeological evidence.